Dr. Nestor is Professor of Psychology, University of Massachusetts, Boston, MA, and Lecturer in Psychiatry, Harvard Medical School, Boston, MA. Dr. Woodhull is a Post-Doctoral Fellow, Edith Nourse Rogers Memorial Veterans Hospital, Bedford, MA. Mr. Newell is a Community Residence Counselor, McLean Hospital, Boston, MA. Ms. O'Donovan and Ms. Forte are Clinical Psychology Graduate Students and Dr. Pomplun is Professor of Computer Science, University of Massachusetts, Boston, MA. Mr. Harding is Director of Clinical Services, SPAN Inc., Boston, MA. To examine the social cognitive processes underlying the relationship of addiction and criminality, we administered the Addiction Severity Index-CF (ASI-CF) and the Iowa Gambling Task (IGT) to 35 participants (11 women) who had been released recently from jail or prison. ASI-CF revealed highest lifetime drug use for alcohol, followed by cannabis, cocaine, and heroin, with an average of 42 lifetime arrests in this ex-offender sample. The men and the women showed similar psychiatric histories marked by depression and anxiety, but the women had more lifetime problems with thinking than did the men, who had higher lifetime problems with hallucinations. On the IGT, participants showed evidence of reward-learning across the initial three blocks of 20 trials, but their performance declined over the last 40 trials, suggesting a failure to sustain gains: that is, to learn from feedback in deciding among advantageous and disadvantageous decks of cards. These deficits in motivated decision-making were moderated by current social and psychological factors, as assessed by ASI-CF. These results are discussed in regard to how disturbances in social cognitive processes may underlie the relationship of addiction and criminality. In light of the persistent and troubling link of addiction and criminality, recent efforts have been directed toward implementing randomized control trials to examine the efficacy of treatment in managing and mitigating risk and reducing recidivism in male ex-offenders with substance abuse.3,–,6 These studies have shown promising results over the short term; for example, Gordon et al.3 demonstrated the efficacy of combined methadone and counseling treatment in reducing self-reported heroin use and criminal activity over six months after release in male inmates who were heroin dependent during the year before incarceration. However, these same studies failed to demonstrate the expected treatment effect in reducing recidivism beyond six months after incarceration (at 12-month follow-up).3,–,6 Thus, as these studies clearly demonstrate, the factors maintaining the cycle of substance abuse and criminality remain an active area of research. Accordingly, in the current study, we examined some of the key dimensions that characterize the relationship of addiction and criminality, with the rationale being that such information may help in developing more effective treatment. This aim aligns well with recent advances in the study of mental health that have emphasized the importance of examining core dimensions of psychopathology rather than discrete disorder categories.7,–,10 Four core dimensions (affective, cognitive, social, and motivational) and their constituent neural processes are frequently the focus of what is often referred to as a transdiagnostic approach to the study of diverse forms of psychopathology.11 These dimensions have, in turn, been studied from the broad perspective of social cognition.12 Here, social cognitive perspectives view substance abuse and criminality as the product of the dynamic interplay of complex social phenomena and their accompanying psychological and neural mechanisms.13 In so doing, social cognition provides a conceptual framework to investigate individual differences in substance abuse disordered ex-offenders with respect to affective, motivational, cognitive and social processes that may factor prominently in their maladaptive behavior and impaired decision-making, as well as in their treatment failure. In the current study, we therefore examined retrospective substance abuse and criminality through the lens of social cognition in a sample of ex-offenders recently released from jail or prison. We also compared male and female ex-offenders as the effects of gender on substance abuse and criminality remains an understudied area of research. To this end, we assessed male and female ex-offenders with the Addiction Severity Index-CF (ASI-CF), a semistructured interview that covers areas relevant to both substance abuse and criminality,14 such as items related to emotion, cognition, behavior, and psychosis and those related to social functioning, such as time spent alone, interpersonal conflict, and family relationships. The ASI-CF also includes items that may be viewed as tapping motivation, as for examples questions regarding satisfaction with use of free time and concerns about legal problems. In fact, we recently examined the IGT and psychopathy in a sample of male ex-offenders who had been released from jail or prison and were receiving services from the same reentry agency from which the participants in the current study were drawn. The results pointed to the close relationship of reduced IGT performance and higher levels of psychopathy, as measured by objective ratings. In addition, both IGT performance and psychopathy ratings predicted recidivism. Perhaps most notably, hierarchical multiple regression results showed IGT to be a stronger predictor of recidivism than psychopathy rating scales in this sample of male offenders.22 We now combined ASI-CF results with those obtained with IGT to examine the relationship of addiction and criminality in female and male ex-offenders. Thirty-five participants (24 men, 11 women) had a mean (SD) age of 43.04 (2.02) years and a mean level of education of 12.63 (10.55) years. Male participants had a mean age of 44.75 (9.26) years and a mean level of education of 12.17 (1.97) years in comparison with the mean age of 39.14 (2.99) years and education of 13.64 (1.80) years of female participants. Of the ex-offender group, 33 percent identified as black/non-Hispanic, 29 percent as Hispanic, 29 percent as white, and 9 percent as other. On the computerized version of the IGT,30 a test of decision-making under risk, subjects are instructed to maximize monetary payoffs by making a series of choices via selecting cards from one of four decks. At the start of the task, subjects are told to select cards to try to maximize their winnings, continuing until signaled by the computer to stop. Unbeknownst to the subjects, there are 100 trials. Subjects view four decks of cards, labeled A, B, C, and D, as well as the running tab of their total earnings. With each selection, the card turns face up to show the winning and loss amounts, which vary between and within decks. Decks A and B are overall disadvantageous, as card selections produce larger wins, but even greater losses, resulting in a net loss. Decks C and D are overall advantageous, for which little money is won on a single choice but even less is lost, resulting in a net gain. IGT performance is summarized by number of advantageous and disadvantageous selections. These are reported as a total net score (advantageous minus disadvantageous). In addition, to examine the effects of experience on task, performance is divided into five blocks of 20 trials, and a net score is calculated for each of the five blocks. Higher net scores on the IGT reflect more advantageous decision-making performance. IGT scores were available for 34 participants. All participants had been recently released from incarceration and were recruited from an offender reentry service program, Span, Inc., located in downtown Boston, MA. All participants first provided written informed consent. Then, the ASI-CF interview and neuropsychological tests (IGT and the oral reading subtest of the Wide Range Achievement Test Fourth Edition (WRAT-4)31) were administered. Testing and interview took approximately 90 minutes and all participants were paid for their time in the form of gift cards. Testing and interviews were conducted by graduate and undergraduate students at the University of Massachusetts Boston (UMB) under the supervision of a licensed psychologist (P.G.N.). The UMB Institutional Review Board (IRB) approved the study. As shown in Table 1, participants reported highest lifetime drug use in mean (SD) years for alcohol followed by cannabis, cocaine, and heroin. Lifetime drug use did not differ in the male and female participants. In addition, lifetime alcohol use correlated with cocaine use (r = 0.416), as did cannabis with heroin (r = 0.443; p = .008). Lifetime use of sedative hypnotics also correlated strongly with lifetime use of amphetamines (r = 0.579; p < .001) and hallucinogens (r = 0.645; p < .001). For men only, the data revealed similar significant lifetime drug use correlations as those found in the entire sample, with the exception that sedative hypnotics correlated strongly with lifetime barbiturate (r = 0.993; p < .001), but not with lifetime amphetamine use. For women, the drug correlations that were also found in the entire sample occurred for sedative hypnotics with amphetamines (r = 0.781; p = .013) and with hallucinogens (r = 0.869; p = .001); lifetime use of amphetamines also correlated very strongly with hallucinogens (r = 0.965; p < .001). Over their lifetimes, participants spent a mean (SD) of 136.91 (135.52) months incarcerated for approximately 11.4 years, with a mean lifetime number of arrests of 42.44 (55.76). The highest reported mean number of arrests were for burglary, larceny, or breaking-and-entering (4.74 (10.96)), followed by parole or probation violation (3.69 (6.28)), drug charges (3.26 (3.62)), assault (2.74 (4.60)), motor vehicle violations (2.46 (6.83)), and shoplifting (2.37, 4.66). Female participants reported fewer overall lifetime arrests (26.00 (17.92)) than did male participants (49.62 (65.20)), as well as fewer arrests across the various criminal charges, but the differences were not statistically significant. In response to the question, “How serious do you feel your present legal problems are?” 22 of 34 participants answered “not at all” and another three participants answered “slightly.” Thus, 73.5 percent of the sample responded either “not at all” or “slightly”to the question of “How serious do you feel your present legal problems are?” There were no statistically significant differences in responses to this question for female and male participants. Last, 18 (51.4%) of the 35 participants were on probation or parole at the time of the study. Probation or parole status differed significantly for female and male participants: 8 (72.7%) of the 11 female participants were on probation or parole in comparison to 9 (37.5%) of the 24 male participants (χ2 (1) = 3.75; p = .05). Of the 35 participants, 21 were never married, 12 were divorced, and 2 were widowed. Twenty- seven (77.1%) participants expressed satisfaction with their current relationship status. Sixteen participants (46%) reported living in a controlled environment, nine (25.7%) lived alone, four with significant others, three with family, one with children alone, one with parents, and one reported no stable living arrangement. Twenty (57.1%) participants reported being satisfied with their current living arrangements and 15 (42.9%) participants were not. Participants were asked the number of days in the past 30 days with serious family conflict. They estimated a mean of 1.37 (5.59) days in the past month with serious family conflict, with four participants (11.4%) reporting being extremely concerned about family conflict. For serious social conflict, participants estimated on average 1.68 (4.51) days in the past month, with six (17.6%) participants reporting being extremely disturbed about social conflict. There were no statistically significant differences between men and women on these measures of satisfaction and measures of number of days in the past month with incidents of either family or social conflict. Twenty-eight (82.4%) participants expressed satisfaction with their free time, and 17 (50%) spent most of their free time with family, 9 stayed (26. 5%) alone, and 8 spent time (23.5%) with friends. A chi-square test of linear-by-linear association was performed to test satisfaction with free time in relation to whether such time was spent with family, friends, or alone. The data revealed a significant linear association between satisfaction and spending free time with family in contrast to dissatisfaction with spending free time alone (χ2 (1) = 7.94; p = .005). In the past 30 days, 50 percent of the participants reported experiencing symptoms of depression, and 62.9 percent responded affirmatively to the question of current serious anxiety, tension, or unreasonable worry. Three (8.6%) participants reported experiencing hallucinations in the past 30 days. For the question that asked participants if they have had trouble understanding or thinking in the past 30 days, 11 (31.4%) answered “yes.” Participants estimated on average 8.42 (9.86) days over the past 30 days of experiencing any of these problems (depression, anxiety, hallucinations, and thinking). Participants were also asked about problems controlling violent behavior over the past 30 days and over their lifetimes. Twenty-eight (80%) participants reported having no problem controlling violent behavior over the past 30 days. By comparison, 27 (77.1%) participants reported having problems controlling violent behavior over their lifetimes. With regard to gender differences, more men (60.9%) reported depression in the past 30 days than did women (27.4%), and this difference approached statistical significance (χ2 (1) = 3.36; p = .067). Male and female participants also differed in reported hallucinations, not in the past 30 days, but over their lifetimes. Sixteen men (66.7%) reported a lifetime history of hallucinations in contrast to none (0%) of the female group, a statistically significant difference (χ2 (1) = 4.75, p = .029). The chi-square test also revealed significant group differences in percentages of the men and women who reported problems controlling violent behavior in their lifetimes: 21 (87.5%) men versus 6 (54.5%) women reported lifetime problems controlling their behavior (χ2 (1) = 4.65; p = 031). However, the data revealed no significant correlation between self-reported hallucinations and lifetime use of hallucinogens. Results also revealed treatment differences with respect to gender, with 77.8 percent of female participants prescribed medications for emotional problems in the past 30 days in comparison to 28.6 percent of the male group (χ2 (1) = 6.12; p = .013). We used four ASI items that asked participants to answer “yes” or “no” as to whether they had in the last 30 days experienced problems with depression, anxiety, thinking, and hallucinations. Their responses, when subjected to a mixed-model ANOVA with one between-subjects factor of gender (male/female) and one within-subjects factor of psychological profile with four levels (depression, anxiety, thinking, and hallucinations), revealed a statistically significant effect for the interaction of gender × psychological profile (F (3,96) = 2.82; p = .04; partial η2 = 0.081). This statistically significant interaction indicated that male and female participants presented with different psychological profiles. Men presented with higher rates of problems with depression and anxiety, in comparison with higher rates of problems with thinking for women. Male and female participants also showed different patterns of lifetime histories for these psychological symptoms, as revealed by a statistically significant interaction of gender by lifetime history of psychological symptoms (F (3, 99) = 3.46; p = .019; partial η2 = .095). Both groups had similar rates of a history of problems with depression and anxiety, but the women reported higher rates of lifetime problems with thinking in comparison to the men who reported higher lifetime rates of problems with hallucinations. The overall group performed in the lower end of the mean (SD) range on the oral reading subtest of the WRAT4 (92.17 (12.45)), which is often used as a proxy measure of premorbid intelligence. On the IGT, the overall group also showed evidence of learning as reflected by improved performance over time on task (F (3,102) = 25.04; p < .001; partial η2 = .424). However, as shown in Fig. 1, IGT performance improved over the first three blocks, but declined over the last two, pointing to a failure to sustain gains. IGT performance did not differ for 16 participants on parole or probation versus the 18 who were not on parole or probation, but did differ for participants (n = 17) who reported experiencing serious depression or sadness over the past 30 days versus those who did not (n = 17). That is, a mixed-model analysis of covariance (ANCOVA) with between-subjects factors of parole/probation status (yes/no) and depressive symptoms (yes/no), with one within-subject factor of IGT performance (blocks 1–5), ANCOVA for gender revealed a significant depressive symptoms × IGT performance interaction (F (4,116) = 2.91; p = .025; partial η2 = .091). As shown in Fig. 2, participants with reported depressive symptoms, despite performing worse than their counterparts for blocks two and three, had higher earnings for the remaining two IGT blocks. Iowa Gambling Task performance of ex-offenders. Iowa Gambling Task performance as a function of reported depression, sadness, or loss of interest in the past 30 days. 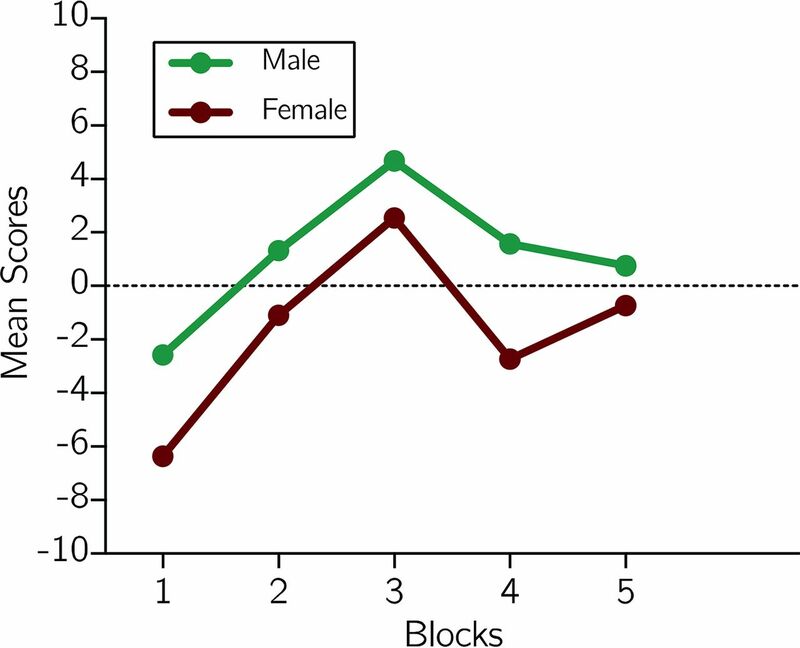 Likewise, a mixed-model ANCOVA with one between-subjects factor of gender (male/female) one within-subject factor of IGT performance with five levels (blocks 1–5), and a covariate of parole/probation status on which the two groups differed, revealed a marginally significant effect for gender (F (1, 32) = 3.93; p = .05; η2 =.109). As shown in Fig. 1, men and women showed similar levels of performance on IGT trial blocks two and three, but the women's performance declined over the last two trial blocks, leading to a lower score. We next examined social influences on IGT performance. Twenty-five participants reported spending most of their free time with family or friends, and the remaining nine participants reported spending their free time alone. We then subjected IGT performance for blocks 1 and 5 to a mixed-model ANOVA with one between-subjects factor of free time (alone, others) and one within-subject factor of IGT (blocks 1 and 5). This ANOVA revealed a significant interaction of free time × IGT block (F (1, 32) = 6.86; p = .013; partial η2 = .176). This interaction pointed to better performance for block 1 for those who spent most of their free time with others (mean (SD)) (−1.52 (7.17)) versus alone (−9.11 (9.12)), but the opposite pattern for block 5 with the free time spent alone group (2.67 (13.96)) outperforming free time spent with others (−0.400 (7.83)). Last, we calculated the median IGT total net (median −$705.00) and divided the sample into high (n = 18) and low (n = 17) IGT performers. High and low IGT performers reported different patterns of lifetime arrests for burglary or larceny versus driving while under the influence, as reflected by the significant interaction of group (high and low IGT) by lifetime arrests (burglary and larceny and driving under the influence) (F (1, 33) = 4.36; p = .045; partial η2 = .117). Low IGT performers reported prior criminal records of a higher number of arrests for burglary or larceny and a lower number for driving under the influence in comparison to the high IGT performers who showed the opposite pattern. The high and low IGT performers also showed different patterns of lifetime drug use for heroin, cocaine, amphetamines, sedative hypnotics, and hallucinogens. That is, ANCOVA with gender as a covariate revealed significant group × lifetime drug use (F (4, 128) = 2.93; p = .024; partial η2 = .084). The low IGT group had greater lifetime rates of heroin, cocaine, and sedative hypnotics, in comparison to greater lifetime rates of amphetamines and hallucinogens for the high IGT group. In the current study, we used a social cognitive framework that combined the ASI-CF and the IGT to examine the dynamics of addiction and criminality in male and female ex-offenders who were recently released from jail or prison and who were recruited from a community-based offender re-entry service program. The results confirmed the long and complicated histories of substance use disorders and criminality in this sample of treatment-resistant, repeat offenders. Indeed, participants had lengthy histories of alcohol, cannabis, cocaine, and heroin addiction, and had spent, on average, a mean lifetime total of 11.4 years incarcerated, primarily for repeated arrests for misdemeanor charges. Notwithstanding their past difficulties, participants, in general, reported a degree of satisfaction with their current circumstances, such as their living arrangements, their use of free time, and their interpersonal relationships. In addition, participants as a group did not express concern about their legal problems, although 17 reported that they were on probation or parole status at the time of the current study. However, our analyses were limited, as we did not distinguish between probation and parole status, nor did we specify the charges underlying probation or parole. On the IGT, participants showed evidence of reward-learning across the initial three blocks of 20 trials, peaking in the third bock in trials 40 to 60. However, their performance declined over the last 40 trials, suggesting a failure to sustain gains: that is, to learn from feedback in deciding among advantageous and disadvantageous decks of cards. Women also performed more poorly on IGT than did men, a finding that has been reported in other studies using nonforensic samples without histories as offenders. In the current study, however, the small sample size of women substantially limits this finding.32 Nonetheless, the overall IGT findings are consistent with prior studies, pointing to evidence of a substance abuse–related disturbance in motivated decision-making. Neuroscientific evidence has suggested that intact IGT performance depends heavily on the orbital frontal lobe connections (OFCs) to the striatum that are vital to instrumental reward-learning,20,33,34 and those can be disrupted by substance abuse.35 Thus, in the current study, that these decision-making deficits emerged on the last two blocks of IGT trials may be viewed as support for an OFC-mediated failure to sustain a proper balance of reward and punishment sensitivity that is essential for learning and sound judgment. The findings also suggest that depression and social factors influence IGT performance, but each showed a very distinct, if not paradoxical pattern, as reflected by statistically significant interactions. For example, participants with lower levels of self-reported depression had higher earnings for the second and third blocks of IGT trials, but lower earnings for the last two blocks of trials. By contrast, those reporting higher levels of depression showed the opposite pattern, with lower earnings on the second and third blocks but finishing with higher earnings across the final two blocks of trials. Hence, the participants who endorsed feelings of depression showed evidence of learning with better performance over the last two blocks of IGT trials. This paradoxical finding may be best understood as sad feelings serving as motivation to improve, which in turn may be expected to be associated with better learning on the IGT. In a similar vein, poorer IGT performance may have been associated with reduced motivation and limited self-awareness in those who are not emotionally troubled or saddened by their current circumstances of lengthy histories of substance abuse, criminal involvement, repeated arrests, and incarceration. In this regard, then, the simple dichotomous ASI-CF item of depression is perhaps best viewed as tapping normal sadness rather than clinical depression. The results point to a similar pattern of IGT performance in relation to social factors, as measured by the ASI-CF item of spending free time with others or alone. 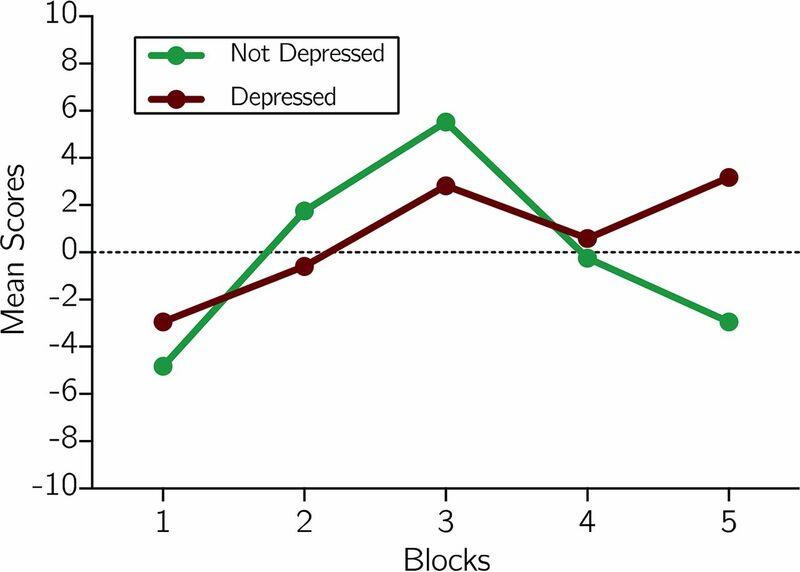 Participants who reported spending their free time with others performed better on the first block of IGT trials but worse on the last block of trials, whereas those who spent their free time alone showed the opposite pattern of performance, beginning worse but ending with significantly higher earnings on the last block. These data indicated improved IGT performance for participants who preferred to spend their free time alone in comparison to those who chose to spend their free time with others. As emphasized in the recent NIMH initiative, known as the Research Domain Criteria, various clinical disorders may have distinct social developmental pathways. In this regard, substance abuse and criminality often first emerge among peers in adolescence, and these problems can be fueled by social pressures in ways that are very different from other developmental disorders that often first occur in adolescence, such as psychotic at-risk states and prodromal schizophrenia. These latter conditions are often characterized by social anhedonia, which is a loss of appetite for engaging with others, leading to isolation and emotional withdrawal. Thus, the results suggested that for this sample of ex-offenders, spending free time alone, which presumably reflected less social connection and engagement than did spending free time with others, may actually have had a beneficial effect in motivated decision-making as measured by the IGT. For women, they endorsed the ASI-CF problems-with-thinking item that asks about cognitive difficulties with concentration, understanding, and remembering. For women, these difficulties may have represented cognitive sequelae of their long histories of drug abuse that have included opiates, stimulants, and hallucinogens. As already noted, women also performed more poorly than men on the IGT. In fact, their IGT performance was very similar to that of male recidivists from our prior study of ex-offenders who had been recently released from jail or prison and were receiving services from the same ex-offender re-entry agency from which the current participants were drawn.22 Finally, IGT performance also correlated with different patterns of lifetime histories of both drug abuse and criminality. For example, the data pointed to associations between poorer performance on the IGT with greater lifetime rates of heroin, cocaine, and sedative hypnotics. Criminality also differed as a function of IGT performance. Low IGT performance was linked to higher arrests for burglary, in comparison to higher arrests for driving under the influence for high IGT performance. In summary, the current study, while lacking follow-up data, again provided strong evidence for the ecological validity of the IGT, coupled with the ASI-CF in explicating the role of decision-making in participants with long and complicated histories of substance use disorders and criminality. Indeed, the current data showed for the first time, to the best of our knowledge, the moderating effects of both social behavior, as measured by the ASI, and gender on IGT performance in this sample of substance abuse, ex-criminal offenders. As such, the current investigation offered support for integrating neuropsychological and semistructured interview measures to examine through the lens of social cognition the relationship of addiction and criminality. However, future studies are needed with larger samples of male and female participants, both to examine the generalizability of the current findings and to plumb more deeply into how gender may influence the social–cognitive dynamics of addiction and criminality.